My middle daughter called last week and was talking about the weather where she lives. It was warm so she took our grandson out to the park. They fed the ducks and played by the water and then headed over to the playground. 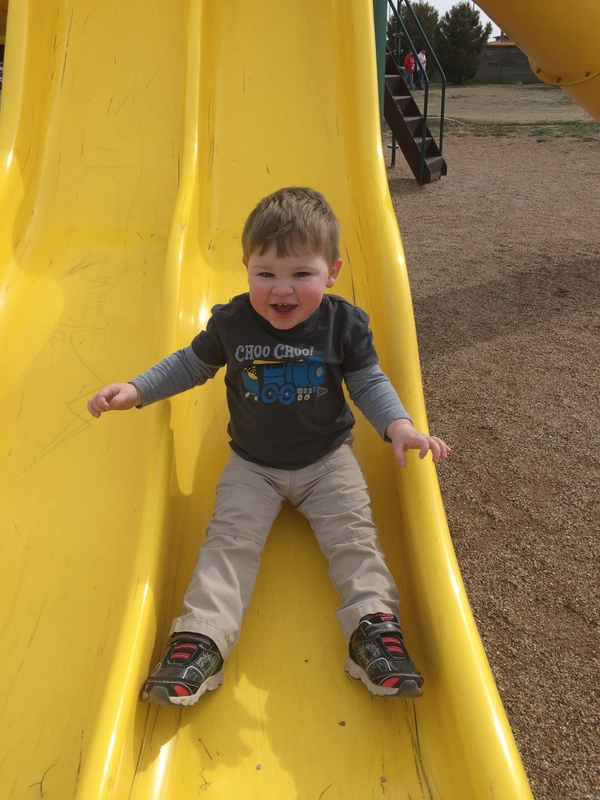 She said he liked the long, yellow, plastic slide and loved to scream while coming down. They did this for a while and then tried some other things, including the swings. The biggest issue of the day was some older kids slinging gravel at each other. She said, “I acted just like you mom and told them to move on or quit!” We laughed and began to reminisce. I laughed and reminded her of the roller slides that went very fast and then dropped off at the end. I rode it one time with her older brother. One time. We talked about other playgrounds and then she said, “Why in the world do they think gravel is so wonderful? He can’t even walk from slide to swing without falling?” I mentioned something about safety and she laughed. My mind flicked back instantly. I saw a small girl and three little boys out in the field behind our house. Knee deep in plowed rows of dirt. I could hear loud screeching and laughter and a deep Thunking noise. I picked up the baby and went to the back porch to check on the noise. They were in the field with trashcan lid shields chunking dirt clods at each other. Most of the time the clod would miss the shield all together. But when it hit, it scared them all. Thunk! Scream! And then she would take off running. Of course they chased her. She would turn and pelt them as they ran unprotected by a shield. I couldn’t tell if there were teams or it was everyman against the other. A while later they burst through the screen door and headed to their rooms. She sidled over to me and showed me a large knot on her head. “I forgot to put up my shield.” I rubbed her head and gave her a hug. “No sock fights until the shields are all put back on the trashcans.” The screen door slammed as they stormed back to the field, picked up the lids, and threw one more clod for good measure. The lids were replaced and long, tube socks stuffed with two or three other socks became the new weapon. The socks made a swinging weapon that could be slung around the head and slammed down to land on another’s back or head or leg. It didn’t always work because the long socks often got tangled. But when it worked, I could hear the “whump” clear inside the house, naturally followed by a howl. The beauty of a sock fight was that it was always performed on the trampoline. Always. The three oldest climbed on the trampoline and yanked the youngest up to the mat. As they bounced, they would jump and pretend they were some kind of Asian fighting warrior. Legs out and arms poised in a fierce warrior pose. “Ayyyeeeeeahhhh” Each jump was accompanied by a warrior scream and a swinging sock. They tried to hit someone on the way down. Of course if you were smaller, that meant you got pelted in the head a lot. When the screams changed from Asian war cries to hurt cries I would step outside and re-settle the battle field. This could last for hours or until someone decided it was time to turn into dinosaurs and hunt meat for the evening meal. “Oh, yes I do remember that one. You used my good kitchen knives.” I could see it clearly. We both laughed as we knew the girls gave as good as they got. I find it sad that young parents today are being squeezed by so rules and regulations because somewhere along the line someone’s kid got hurt or got their feelings hurt. Of course, they got hurt. It is part of life. It makes us appreciate the smooth times. After all, if you learn to stand on your own two feet in the middle of a dirt clod war, just imagine how much easier life will be when the going gets really tough. This entry was posted in Posts, Stories / Articles and tagged America, Boys, Children, Family, Mother, parents, Relationships, sisters. Bookmark the permalink.